What type of baby games have you played with your child or children? The internet is full of sites with free interactive pages for kids but they might put them on information overload if you haven't established a firm foundation in developing learning skills. Remember some basics? The bonding that takes place between parents and older siblings and a little one will be important in establishing happiness level for the rest of their life. Grab a large coffee table book and open and close it in front of them to feel the puff of air and hear the sound the book makes when closing. Make some Puppets out of brown paper lunch bags to extend the bag's life cycle with glue and cut out card stock paper shapes for tongues and facial features, bow ties and other clothing accents. High five and low five, where it started, who knows? Get them prepared for when an adult attempts to try it out on them and watch their reaction when they aren't confused or startled and are ready to respond. Woo hoo, instant excitement! Patty cake is great for hand-eye coordination. The "pat-a-cake" clapping game is based on a traditional Mother Goose Nursery rhyme with alternate normal claps with two handed claps with the other person. Ask the OG in the room or "Google it" to refresh your memory on this classically simple game. Peek-a-boo, the game by lifting a towel up or peering from behind a door jamb is a simple way to get a reaction. You are there, then suddenly they have to re-focus and when they see that you haven't really gone away, it's a priceless look. Hide and seek extends the idea and is fun when they are at pre-school age. Bubble wands or bubble machines are inexpensive ways to create fun and create a sense of wonder within your child. Balloons, balloons, and more balloons. The time tested number one "attention getter" whether filled with helium or not. 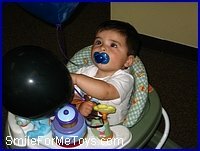 Maybe it's the texture of the rubber, the elusiveness when grabbing at one, or the high pitched squeaking sounds they tend to make, but balloons remain at the top of kid's favorites. All games enhance learning skills so they can learn about "cause & effect" and get a feeling of accomplishment. When you give a baby's mind something to think about, you increase cognitive development and prepare them for the next lesson. Personalities differ so don't over crowd a kid having a great time and ruin the moment with your camera. They may start to resent a camera when it intrudes on their joy just when you want to capture it! Don't over press for the goal of smiling for a camera. Kids sense an agenda and they will feel best about themselves when they feel love, patience and acceptance from their family. The best photos will be when you let them have fun with baby games, see them relax and make it fun to smile for the camera.